Born in Kwangju, Korea to Presbyterian missionary parents, David Hill’s family moved back to the U.S. where his father became Chaplain to the famous Texas Rangers. 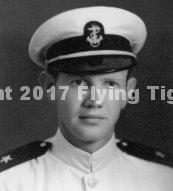 Hill earned his degree from the Austin College in 1938 and entered Naval flight training in Pensacola, FL the same year. He received his wings and commission on 1939 and joined the fleet as a torpedo and dive bomber pilot aboard the USS Saratoga and SB2U-2 pilot aboard the USS Ranger. Tex resigned his commission (Lt.jg) in the summer of 1941 to join the First American Volunteer Group (AVG) to defend the Burma Road for China. Tex Hill began his duty with the AVG as flight leader of the 2nd Squadron and was promoted to 2nd Squadron Leader in March, 1942. His first aerial combat victory was on January 3, 1942 when he downed two fighters flying as wingman for Jim Howard on an air raid at Tak, Thailand. he shot down two more fighters on January 23rd and became an ace on January 24, shooting down one Japanese fighter and bomber over Rangoon, Burma. Hill went on to become a double ace and totaled 12.25 victories with the Flying Tigers. Hill accepted a commission of Major with the USAAF the day the Flying Tigers were officially disbanded (July 4, 1942). “I changed hats that day and went right back to work with the 75th Fighter Squadron, 23rd Fighter Group.” After his first tour, Hill returned to China at Chennault’s request to command the 23rd Fighter Group and before leaving China for the last time, scored six more aerial victories and becoming a triple ace. Col. Hill, along with Casey Vincent, planned and lead the highly successful Thanksgiving Day, 1943 raid on the airfield at Formosa. Thirty U.S. fighters and bombers attacked over 200 Japanese bombers and fighters in the air and on the ground at Shinchiku airfield destroying 42 enemy airplanes and 12 probables. There were no American casualties. Tex separated from the AAF in July of 1946 and came home to San Antonio, Texas where he became commander of the 58th Fighter Wing of the Texas Air National Guard. He resigned his commission for a special assignment to Africa. Upon returning to the U.S., he rejoined the Air Force Reserves and served until he retired in 1968. Tex is active in several flying organizations, serving and leading such groups as the Flying Tigers Association, American Fighter Aces Association and the Vice Commander of the Order of Daedalians.